300 kids tiffin box recipes. kids veg tiffin snack recipes. Have you ever passed by a school building when the kids are having their snack break? Oh my goodness, what joyous chattering and chirpy young voices you can hear! Indeed, snacks break is a time that kids really look forward to. It is a break from their studies and school activities, and a time to catch up with their friends. And, of course, kids always love to peep into each other’s tiffin boxes and share what they have all brought together. You must see the glow of pride on the face of the kid with the most exciting snack in his gang. It’s simply too delightful! Every mom wants her kid to be part of that league with the most interesting snacks. The smile on the child’s face is every mother’s greatest gift. Yet, in the business of the morning, it is a little tough to decide what to make and pack in the tiffin box, and we so often end up packing the same old roti and aloo, or packaged biscuits. Not that we intend to send something normal or boring; it’s just that we lack the time to decide on something wonderful and prepare it. Not to worry. 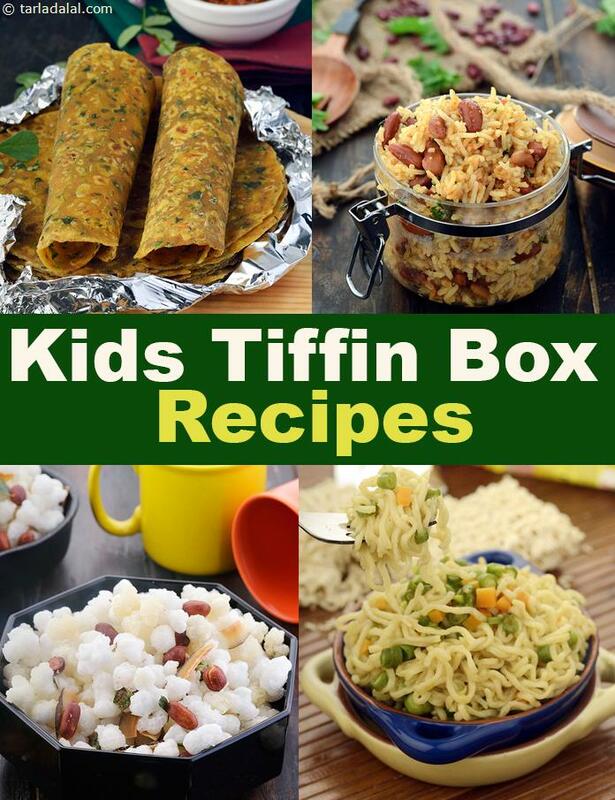 This is a collection of amazing tiffin box recipes for kids. From muffins to parathas and cookies to crunchy-munchy jar snacks, we have thought of everything that kids love. When you have time, you can prepare something fresh like the Jowar and Vegetable Paratha, Baby Corn and Capsicum Rice, Creamy Pesto Pasta or Rava Toast. Sometimes, we are hesitant to pack stuff like pasta thinking it will become gooey or thick when the kids eat it later, but we have made all these recipes such that they will remain good for 3-4 hours. So, stick to the ingredients and proportions we have mentioned to ensure that it stays good later. Jar snacks always come to the rescue when you are running short of time. Once in a few days, when you have a little free time, you can prepare a batch of Eggless Chocolate Chip Cookies, Baked Oats Puri, Bajra Chakli or Whole Wheat Carrot and Raisin Muffins, and keep them handy to pack for kids tiffin box on busy days. When packing these make sure that you use dry, airtight tiffin boxes so that they will remain crisp. However, make sure your kid can open the box comfortably. At times, teachers complain of parents sending snacks in boxes with over-tight lids. Kids then make a beeline to the teacher’s desk to get the box opened or attempt to open it themselves resulting in spills. So, balance airtightness with ease of opening when selecting the box. Kids love to have some rice or pulao in their tiffin box. The vegetable fried rice recipe is is a tasty and satiating one-dish meal, which can be made in minutes, but stays fresh for over five hours. The crunchy veggies add a splash of colours and myriad flavours to the dish, while the readily available sauces add an enjoyable pungency to it. A nice, bright pink rice that is sure to attract your kids, the Beetroot Rice is an attractive preparation of rice and grated beetroot perked up with assorted spices. Onions add flavour and crunch to this sumptuous dish, which is quick and easy to prepare in the morning. Ensure that the Beetroot Rice is completely cool before you pack it in the box. Sipping Mint Chaas along with the Beeetroot Rice is sure to satiate your kids taste buds and tummy! So do pack some in a thermos flask. The exciting noodle-like appearance of vermicelli really works in favour of the Sevaiyan Pulao, making it a hot favourite with kids. Kids love to play around with the long, slippery strands of the semolina vermicelli, while moms are content that a lot of veggies are also going in with it. Children are generally very fond of the flavour and texture of cheese, but sometimes parents find it challenging to pack cheese-based foods in the snack box as it tends to get chewy. But, this Cheese, Onion and Green Peas Pulao is a delightful option, which stays fresh in a tiffin box for five hours! Moreover, it has an interesting mix of ingredients ranging from rice and green peas to grated cheese, which makes it tasty and wholesome too. Always try to decide your menu for breakfast, lunch and tiffin boxes the previous night itself, so that you can make any pre-preparations earlier. Mornings will turn out to be much more relaxed then! You can cook and pack with a smile, and be assured of a larger smile blooming on the young one’s face. Enjoy our Kids Tiffin Box Recipes, kids veg tiffin snack recipes and related Kids Food Articles below.